Following one simple habit every morning could save your life, by reducing risk for heart attack and fatal coronary heart disease (CHD). This healthy practice may also prevent weight gain, which in turn decreases your likelihood of developing type 2 diabetes, some forms of cancer, and other dangerous diseases, including CHD. The morning ritual that does all this is eating a heart-healthy breakfast, research shows. With “fasting diets” gaining in popularity, the BaleDoneen Method recommends NOT skipping your morning meal. In a new study, doing so was linked to increased risk for low-grade inflammation and blood sugar issues. Here are some delicious nutritional powerhouses to put on your plate in the morning. Fresh fruit and vegetables. Many studies show that the more fruits and vegetables people eat daily, the lower their risk for cardiovascular events. Intriguingly, eating an apple a day really does keep the doctor away, since eating white fruits and vegetables–such as apples, pears and cauliflower–was linked to 52% drop in stroke risk in a recent 10-year study. A large 2017 study reports that eating more than 3 servings daily of fruits and vegetables also reduces risk for peripheral artery disease (PAD) by 18%. Low-fat yogurt or cottage cheese. An excellent source of vitamin D, magnesium, potassium and other heart-protective nutrients, dairy products were associated with a 12% and 13% decreased risk for CHD and stroke respectively in a 2015 analysis of 22 studies that included more than 900,000 participants. The researchers found low-fat dairy to be particularly beneficial. Yogurt is also an excellent source of probiotics (bacteria that enhance gut health). Whole grain cereal. 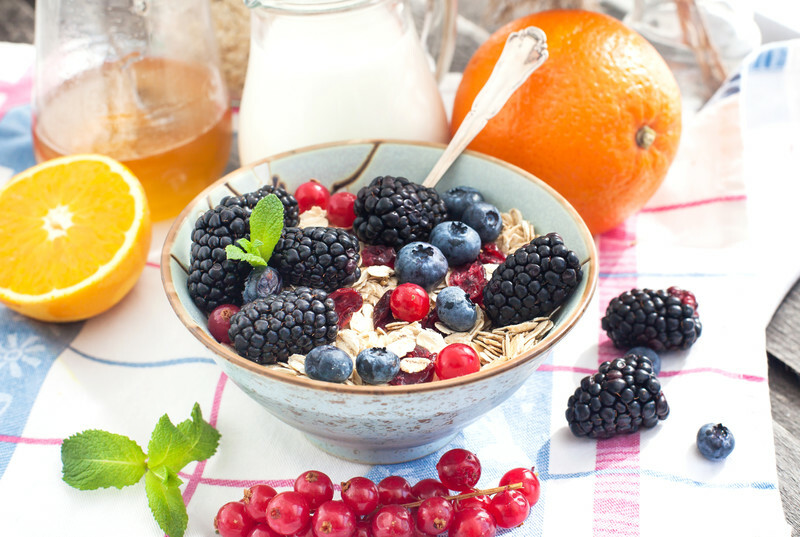 Whole grains, such as oats/oatmeal, buckwheat and bulgar, are rich sources of fiber, which can help lower cholesterol and risk for heart disease, stroke, obesity and type 2 diabetes. An analysis of 10 studies found that for each 10-gram increase in the amount of fiber people eat daily, their risk for fatal CHD fell by 19%. Another study reported that people who ate the most fiber were 50% to 58% less likely die from CHD, infectious diseases or respiratory illnesses than those who ate the least fiber. Nuts. People who eat nuts frequently are 30% to 50% less likely to suffer heart attacks, sudden cardiac death or heart disease, compared those who eat them rarely, according to very large studies. Among their cardiovascular benefits are improvements in levels of both LDL (bad) and HDL (good) cholesterol, and protection against blood clots that could trigger a heart attack or stroke, Harvard University reports. Since nuts are high in fat, we advise eating them in moderate amounts. Fish. Oily cold-water fish, such as salmon or herring, are high in heart-healthy Omega-3 fatty acids, as well as CoQ10 and selenium, nutrients with antioxidant effects that have been shown to dramatically reduce death from cardiovascular causes. Coffee. Two new studies that included more than 500,000 people link coffee consumption to longer life. Researchers also that the invigorating brew reduces risk for CHD, stroke, respiratory illnesses, diabetes, cancer and kidney disease, among other ailments. Agree with your program. Do not understand the medical community’s failure to endorse it.